Ron and Maggie Tear Photography: Old African Lion,Mikumi Nat Pk,Tanzania. Old African Lion,Mikumi Nat Pk,Tanzania. This very old Lion a male that hsa been evicted from his pride, was spotted in the shade as we drove around Mikumi National Park, in Tanzania. He was not alone ,another old male was with him the pair may have had some relationship( brothers, maybe) but they were past their best. When this male yawned he had only three teeth as far as we could see.This probably was the reason that they were together, a larger force. 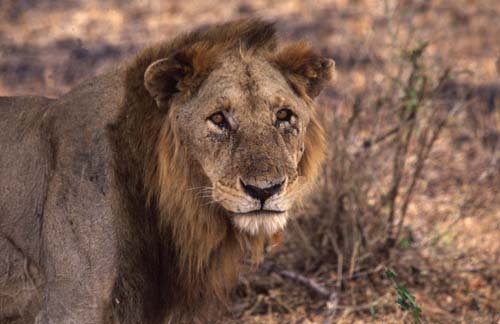 He looked tired and sad but still retained the magnificence of a lion.